Skeletonized and scaled back in size but not in functionality. 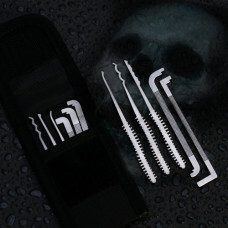 The Night Crawler set is a daily runner with full functionality that bridges the gap between back up mini picks and a full set. Consisting of hooks, rakes, and knurled flat bars in different thicknesses this is a very well balanced EDC lock pick set.